Day Four of the marketing workshop was all about marketing. The day was created to help ALL artists in attendance .... from those already selling their art to those who aren't sure if they will ever sell their art. Dreama and I shared our personal experiences, tips and recommendations as it pertained to mailing lists, newsletters, websites, blogging and marketing. We were able to share all of our resources on the big screen. This was not a time for us to hold back ... we shared everything! Dreama and I are pleased to announce we will be holding another workshop in February in Atlanta, Ga. Signups will open in about a week. We are very excited to come east and were so thrilled with this workshop that we hope to teach again many times in the future. 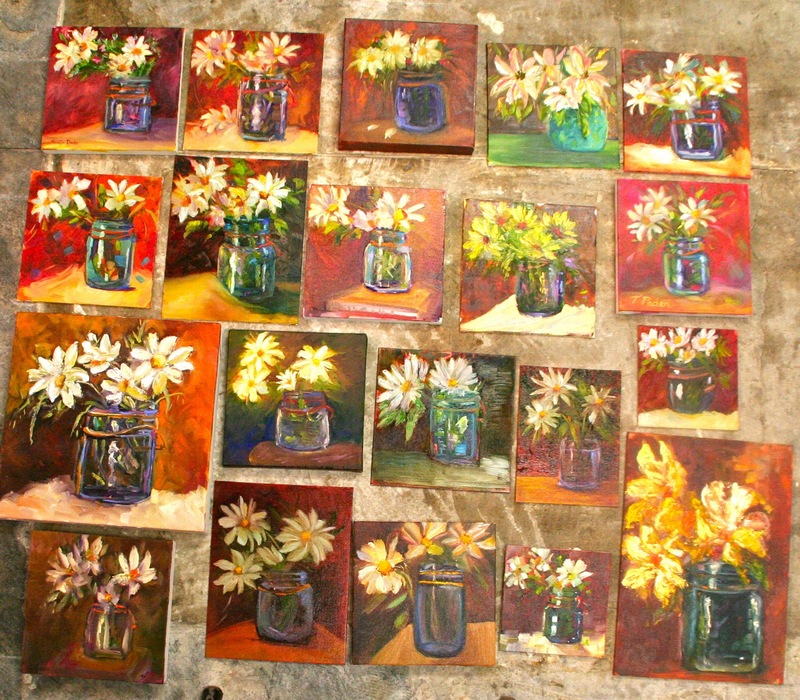 I also have some two day workshops scheduled in 2011 so visit my workshop page on my website for more details. I head to Hawaii tomorrow to coordinate a large incentive program for my favorite client, so you should see some Hawaii paintings this next week. Mahalo! Workshop attendees (not listed in order): Nancy Goldman, Kadija Behairy, Fiddy Hakim, Julie Regan, Christine Benz, Carole Gentile, Jane Copper, Lois Olsen, Sue Feldmeth, Jerry Stocks, Teressa Sliger, Stevie Denny, Carol O'Toole, Linda Phillips, Theresa Paden, Beverly Koldon, Joyce Dodd Harcharik, Gail Alexander, Dina Adamson, Susan Drake (not pictured), Drama Tolle Perry and Leslie Saeta. Randy Higbee from Art & Frame Company shows how his "floater frames" work perfectly for canvas panel paintings. Our group then broke off and painted yet another beautiful painting (if you are counting, that means they are on painting #4!) and Dreama and I each had a lot of time to spend with each artist individually. The paintings were beautiful. That reminds me, if anyone has pictures of the 19 finished paintings or any of the paintings competed that afternoon, please send them to me. Thanks! Later in the afternoon we had a wonderful visit from Randy Higbee from Art & Frame Company. Randy showed us all his wonderful floater frames and then offered great prices to the class on the many, many frames he brought with him. So many of us took home finished paintings in beautiful frames! Workshop demo painting, 12" x 12"
Here I am beginning my demo of palette knife painting. After an amazing first day and very fun evening, on day two it was my turn to demo. When I taped up photos of the "boat photograph" on everyone's easels, there were quite a few dirty looks and comments that I was crazy to think they could all paint the scene ... let alone with a palette knife. But within a few hours I had successfully converted twenty amazing artists to "loosen up" and enjoy the thick paint and knife strokes. The day was absolutely incredible and everyone had so much fun. And with Dreama and myself visiting everyone's easels there was a large amount of time spent with each student! I was so impressed with the final results as there were 20 amazing palette knife boat paintings completed at the end of the day! 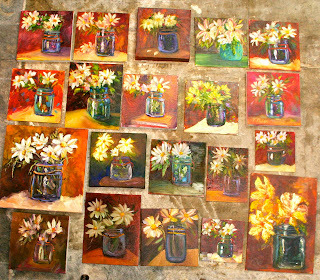 These are the completed paintings of the workshop attendees. Beautifully done! At four o'clock that afternoon, Dreama and I raced home to prepare a dinner which consisted of crab cakes with lemon dill sauce for an appetizer and seared ahi with maple soy sauce (and flank steak) for the main course. Of course, homemade mud pie topped off the evening for dessert. Needless to say, we were all exhausted but very happy! And the dinner conversation allowed everyone the chance to talk about where they wanted to take their art and the exchange of ideas and suggestions was amazing! 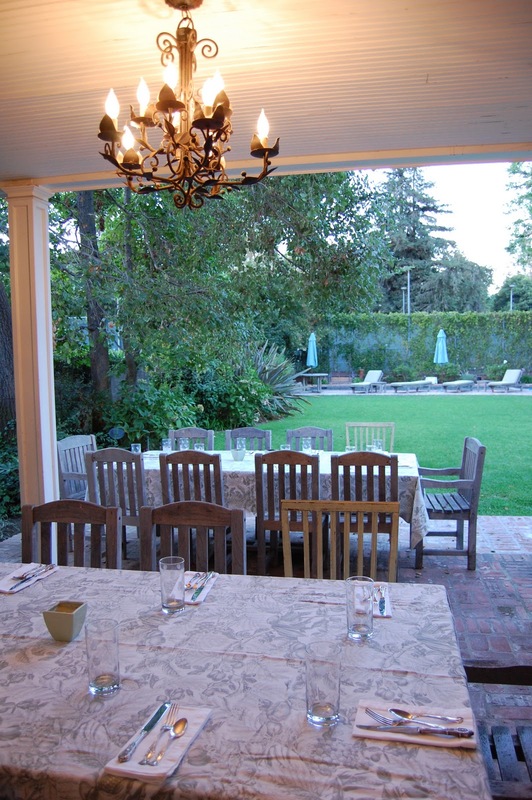 The tables are set in my backyard for our second gourmet dinner! Dreama's beautiful demo from Day one! I never imagined it would take me so long to post about our workshop this week. But when you teach from 9:00 - 4:00 and then race home to cook a gourmet dinner for 22 people, there isn't a lot of computer time (or energy) to blog at the end of the day! Dreama begins her talk about "transparent colors". When Dreama and I decided to teach a workshop together, we talked to a lot of artists about their own workshop experiences to find out what they liked and didn't like about workshops. We found a lot of artists were very intimidated when they faced an empty canvas after watching a half day demo. We also found that many artists were frustrated with the paintings created during a workshop and really wanted to bring home workshop paintings they were proud of! And finally, we found many artists wanted to paint faster and with more confidence. So Dreama and I came up with a new approach, a different way to demo and a really fun exercise to help our students to learn to paint faster. So we used a "team" format that was very different but really focused on "the joy of painting". And I must say ... say the workshop has been amazing! On the first day Dreama did a demo of her amazing painting techniques with transparent colors. And as you can see, there were 20 beautiful paintings completed by the end of the day. Twenty beautifully completed paintings! Aren't they incredible? 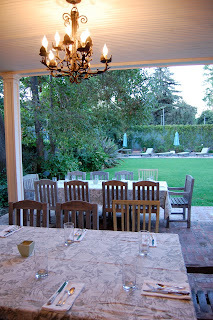 That evening we had the group over to my house for "fireside chats" and a gourmet meal. The flat bread pizza appetizers (both artichoke and pesto) were a big hit as was the barbecue dinner and homemade berry cobbler! Here we are enjoying grilled flatbread pizza for appetizers! Day one was an incredible day as Dreama and I were blessed with a wonderful group of 20 women who flew from all over the country to take our workshop! We had so much fun! I had a really wonderful opportunity to paint this painting for the set of one of the top new TV Shows premiering next week. It is a larger piece, 30" x 30" and although I completed it in record time, it was a blast! My art is also on the set of the popular TV show "Modern Family", so Hollywood ... here I come! Today was a crazy day as I was taking care of all of the final plans for the workshop. Dreama and I really want this to be an incredible experience so we have lots of surprises and fun things to do during the four days. But the preparation is pretty hectic ... and we still have a few last minute things to do (like shop for the gourmet meals ...). I managed to find a bit of time this afternoon to head up to my studio to paint. I am trying to finish a few paintings and I had a lot of fun with the yellow in this one. It's not a color I use often and wow ... is it fun to paint with! I did get a notice that my painting "Stuck Together" was selected for the National "Painting Only" Competition & Exhibition at the Pacific Art League in Palo Alto. Oh darn ... looks like I will need to head up to Palo Alto to see my painting displayed! (Palo alto is the town next to Stanford). Sounds like an important "business trip" in my near future! Oil, 8" x 10" on museum quality canvas panel. I have a very busy week ahead. I am so excited I can hardly stand it. Dreama arrives on Wednesday and we teach our workshop Thursday - Sunday. I already have the "gourmet" meals planned for our workshop students on Thursday and Friday night. Hopefully they will enjoy the seared ahi, crab cakes, grilled steak, smoked salmon, grilled chicken and mud pie. I know I am going a bit overboard but I just want to m make sure there is something that everyone will like! I doubt we will go hungry. I painted all day today. I am heading to Hawaii in a week and a half and thought it would be fun to paint in anticipation for my trip. Gotta love the color of that water! I am definitely going through a "red stage" right now. There is something about bright red (and orange) paint that makes me happy. So I hope you don't mind if there are a few red boats on my blog this week! Dreama and I are getting ready for our workshops next week. 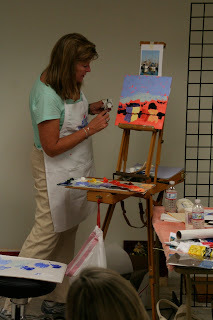 The three day painting class is full and I am so excited about everyone who is attending the workshop. We are going to have a blast! Dreama and I do have space in our one day marketing workshop which will be held in Pasadena on Sunday, September 26th from 10:00 - 4:00 pm. If you are local, you won't want to miss it. This will be a hands-on workshop experience so be ready to have us look at all of your marketing efforts (website, blog, business cards, newsletters) as we will assist everyone personally! And if you don't have any marketing materials then this is a perfect workshop for you! For more info click here. I do have a few spots left in my one day October 16th workshop which will be held at Cannery Arts in Newport Beach, CA. The one day workshop is all about palette knife painting and if you are in Southern California, I don't think you will want to miss it! Please email here if you would like to sign up for the class. One of the things that we all love about Southern California is our amazing weather. I have to admit that I was a bit worried this past week as it felt like fall weather had arrived ... which is at least two months too early! But today the sun came out and I feel like the weather is back to normal! So ... we are filming a commercial at my house today and I am trapped up in my studio. And that is a good thing ... I should have locked myself up there last week ... and the week before ... and the week before. I just finished this painting. There is a little boy (he looks like he is about three years old) in my kitchen right now who has repeated his one line at least a hundred times. His mom is feeding him his line every time. Unbelievable ... these people are amazing as I have no idea how they have the patience for this! "San Fran From the Bridge"
Oil, 5" x 7" 0n canvas panel. Two weeks ... I cannot believe I haven't posted for two weeks! It's weird because I have been around but for some reason I just haven't made it to my easel. Dreama and I were trying to figure out "where I have been" these past two weeks and I think I was just "soaking up" the time with my kids before school started. My oldest is back at college ... well kind of ... he is actually training with his swim team in Baton Rogue ... and we will drive his stuff up to Stanford next week when he flies in to Northern California. I have spent a lot of time coordinating the completion of my new outdoor kitchen (it's done!) and doing lots of art related stuff. If you listen to our Artists Helping Artists weekly radio show, we have all of the shows scheduled and posted on the blog for the next two months. We have a star studded lineup including Alyson Stanfield, Steve Doherty, Clint Watson AND Kevin McPherson! I am so excited and amazed that all these incredibly talented people have greed to be on our show. You can always listen to the shows anytime as they are recorded and the links are posted on our blog. So, I am back ... and I won't disappear for two weeks again ... I promise!